Discussion – for the love of reading. I recently read Cheryl Boes’ article in Edutopia about promoting teacher book clubs as an opportunity for individualized, engaging and meaningful professional development. The objective is simple: teachers from a variety of school systems utilize an online forum/blog, to engage in conversation about a common text, which will in turn inform the practice of those involved. As some of you know, Beth and I have been working hard over the past few years to re-ignite our students’ love of reading (read more about that here), and figured that this professional practice goal would be a great diving board for an interdisciplinary online book club. 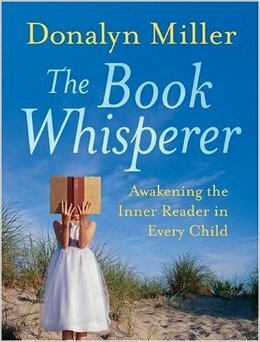 Donalyn Miller’s The Book Whisperer. The book can be purchased on Amazon for around $14 (Kindle version) or paperback for $19. It is available in many libraries throughout the region as well. As far as schedule, the book is broken up into seven chapters that vary in length. I’m thinking that either Beth or I will write a post per chapter with a few questions, and then using the threaded-conversation model on our website, we will share our thoughts, questions and ideas for application into our own practice. We’ll post our first set of Chapter Questions around the middle of September to give you time to get your hands on the text. Realizing that we are all very busy (we are teachers, after all), I’m proposing a reading schedule that allows for flexibility with each person, so we will post new Chapter Questions every other week. If you scroll down on this page, you can elect to “follow” our site. This function will send you an email whenever we add a new post about our online book club. A1: What brought you to this online book discussion? What are you hoping to gain from it? A2: In the first chapter, Donalyn Miller discusses what she used to do and how she was “lost in the wilderness” (12). Can you think of an aspect of your craft as an educator that you could improve on? Have you ever been “lost in the wilderness”? A3: What were some of your first memories as a reader, and how does this shape who you are/were in the classroom? Q1: Miller writes, “Although I never state it outright to my students, my mandate that they read and the enthusiasm I show for books sends a powerful message. I want my students to know that I see each of them as a reader” (23). What do you want your students to know, and how do you send this message? Q2: Miller’s asserts that all students are readers; some just haven’t come into their own yet. The key to engaging readers, according to Miller, is “providing students with the hoportunity to choose their own books to read” (23). How do you see this working in your classroom? What reservations exist? Q3: In this chapter, the author identifies three types of readers: developing, dormant, and underground. (Chris and I created our own fourth type: avid, lifelong readers.) What type of reader were you in school? What type of reader is the most difficult for you to engage in your practice? Please feel respond to these questions in the “Leave a Reply” box at the bottom of the page. I’ve tagged each question with an indicator (A1, A2, A3), so feel free to reference those when you respond. It’s up to you if you want to do this, but it may help others respond to your thoughts. Also, if you want to respond to someone else’s comment without starting a new thread, you can click on “reply” in the top right hand corner of their post. We’ll see how this works out for the first chapter and adjust if necessary. Thanks for being flexible! I’m hopeful about this experience and am looking forward to networking with you all! Thanks for organizing all of this. I’m Janet Keirstead, the English Language Arts Curriculum Coordinator for grades 6-12 in Westford, MA, which is a relatively affluent suburban town. This is my eighteenth year in education, after a brief stint working in retail management. I look forward to our discussion. Hi, everyone! My name is Kate Goodwin. I used to teach English with Beth at Wakefield Memorial High School. I now teach Humanities at the Chicago Waldorf School, one of the largest high schools in the American Waldorf movement. I love A LOT of aspects of Waldorf, but I struggle with our focus on classical (and Western European) literature. On the one hand, I do see how the Iliad and Odyssey speak to the universal experience of the teenager, but on the other hand, I’m really tired of having “class discussions” with myself! And I want to find time to read for pleasure again. Year in and year out, I read the same books to prepare for my lessons, and when I have free time, I run from books like my students run from those ridiculously repetitive passages in Homer. I look forward to our time together! Hello! My name is Julie Pfordresher and I am a former high school chemistry teacher and current stay-at-home-mom (SAHM). As a SAHM, I’ve had the good fortune to read 320+ books in the past 4 years, and I’m still going strong! Being such an avid reader and a mom-of-two, I think encouraging students to read is the absolute best thing we can possibly do for their education and “real life” preparation. Seriously, books are my life (well, besides my kids, I suppose). I’m hoping to return to teaching in the 2016-2017 school year, but my other dream jobs are librarian or editor. It’s amazing I ended up with a science degree at all, and I did contemplate a double with English (I do have a writing minor). On the professional end of things, I’ve always wanted to incorporate reading a trade book into my classroom, but haven’t come across the right fit (most I’ve read are just too dull or technical), but I also have no idea how to fit it into the regular curriculum, which I’m always rushing to finish by year’s end. I’m looking forward to this group! Hi! I am Bridget Hagerty. I work with Beth and Chris. I’ve been a high school teacher for the past thirteen years, all in Wakefield, MA. I am excited to learn from all of you and hear your thoughts about reading! Hi! – My name is Sue Langlois. I teach 5th grade English/Reading/SS at the middle school in Wakefield. Two of my children have been blessed with Beth as an English teacher, and ~ besides the fact that THEY love her ~ her enthusiasm for reading and our mutual love of The Book Whisperer has me excited to participate in this discussion group. A3 – My first memories of reading: Sitting on the couch with my mother,, reading Hop on Pop is my very first reading memory. I remember being proud of myself and loving the illustrations and rhyming words. My true love of reading happened in 1st grade. Miss Buckley (who I have seen at a bunch of retirement parties and thanked profusely for helping me to love reading) rewarded all of her students with a book after we read a secret word. I received the book Swimmy, and I was so very excited! The following year, with Miss Kelly, I was able to visit the older kids’ section in the school library, and I devoured books like B is For Betsy, Beezus and Ramona, etc. I moved on to the Little House series, Judy Blume, and then a whole bunch of afterschool special type books. I spent most of my childhood with my nose in a book, escaping my shyness and always remembering my earliest teachers. I can’t remember any of my jr high teacher’s books (yes, I’m old enough to have gone to a jr high school), and that makes me sad. I don’t want my kids to leave my room with a diminished love of reading, so I try to incorporate reading for fun into my class time. It’s getting pretty near impossible – we lost our long directed learning class (20 minutes homework help, 20 minutes silent reading) and have assigned us scripted modules that made just about every kid hate a potentially really enjoyable book. I keep trying to pass The Book Whisperer on to my colleagues, but I keep hearing that there is no time, that we have to hold the kids accountable for reading, that we have to give them grades and reading logs. I love my colleagues – they are some of the best teachers and people ever – but they won’t drink the Kool-Aid and that makes me sad. I am trying to figure out a way to get silent CHOICE reading time back into my kids’ day, but I haven’t figured out a way yet. My family belonged to a Dr. Seuss book-of-the-month club, which we loved! When my brother and I were older (maybe 9 or 10? ), we found the box of all the Dr. Seuss books in the loft above our garage one summer, and we spent a few days up there reading them all again! Sue, thanks for joining the discussion! About silent choice reading: last year, Beth and I started devoting the first 10 minutes of EVERY class to silent choice book reading. No hooks. No questions. No quizzes. Just getting LOST in a book. My students cherish this time, and already in week three, I have students who show up early (yes, 2015 sophomores in high school) to class in order to get a few extra minutes of reading. The payoff is extraordinary, and I give Beth lots of credit for encouraging me to start doing this last year. My 8th grade ELA teacher did this with us. He assigned a student to be timekeeper. When it was my turn, I think we were doing closer to 20 mins (and he definitely knew it!). I guess my only issue with it would be that it was amazing for me, but with no tie-in to the other activities in the classroom, the kids that don’t like reading just pretended to read or goofed off during the time. How do you relate your lessons back to the independent reading piece? The silent reading works–especially if it’s daily, at the beginning of the block, and the teacher reads, too. Sadly, I didn’t learn to love reading until I was out from under “the man,” as my students would say, and forced myself to fall back in love with it. “It’s not you; it’s me,” I had said. But after a little couples counseling, reading and I are hot and heavy again. And that is my hope for all of my students. A1) My love of reading and my hope to instill that love of reading in my children brought me to this group. I hope to gain some fellow bibliophile friends and get back into teacher mode after my 4 year absence from the field (even if I teach science). I love talking shop! A2) Yes! I was definitely “lost in the wilderness” my first year teaching. I taught the students like I had been taught (not all of which was bad), but mostly followed a traditional “go over homework, notes on the board, practice work (ok, let’s call a spade a spade – worksheets), occasional lab or project, give homework” model. In later years I played around with abolishing numeric grades (totally awesome concept but logistical nightmare) and then I settled on flipping the classroom. I’m not sure how well a flipped classroom applies to English/LA, but it basically means my homework assignments are actually previews of the next day’s lesson instead of reviews. I expect the students to struggle with the material on their own first, but I make sure the struggle isn’t discouraging. I could go on and on about how it works and the benefits I see from it, but I don’t want to bore you all to tears, so if you have any questions about it, let me know! Basically, my overall approach now is heading toward more student choice (sound familiar?) and student autonomy. I’m really trying to get them to take ownership of their learning. I think that’s going to look more like a portfolio-based grading system in the future, and tying back to A1 above, I think Miller’s book is really about student choice and autonomy in general so I’m still picking up lots of amazing ideas! A2: Julie, in ELA, we flip instruction all the time… students read their assigned long text at night, and we discuss the next day. There is certainly struggling that occurs, and I couldn’t agree with you more about that being integral to the learning process. As we continue to up the rigor and introduce more difficult texts (a benefit of CCSS! ), I’ll continue to rely on this model and then supplement it with close reading. Chris, I was going to say the exact same thing about ELA – we were a flipped classroom before it was a thing. (Julie places palm to forehead) – Of course you have a flipped classroom! I don’t know why I didn’t think of it like that. We scientists are slow to catch on, I guess! Julie, I’m so glad you’re here! I love that this conversation permeates the walls of our discipline silos! And choice is absolutely crucial–whether it is allowing my students to choose a text or laying out two outfits for my daughter when she was five and allowing her to “choose” which one she’d wear. I’ve been on Goodreads since 2010! I LOVE it! My problem with science reads is that I haven’t found any that would be any fun! They’re always too dry or too technical. I’m actually working on one now titled Molecule of Murder which is pretty well-written for the non-scientist, but it’s still not a page-turner! I was hoping to use it to host an in-class murder mystery party, which would be really fun, but I can’t quite connect it with the chem topics I teach in a way that would be educationally meaningful. My favorite English project was to dress and act like a character from one of the short stories we read throughout the year (I think it was junior year). We all had to bring in food that would be something our character would have eaten, too. I honestly don’t remember who I was, other than a southern gentleman who hanged himself (I wore a suit and a noose around my neck as a costume and spoke in a horrendous southern accent), but the story completely escapes me. Sorry everyone! I already warned Chris I might blow up this discussion! But I have one more thing to share, not strictly related to any of the questions. I want to share why I am NOT an English teacher. I had the traditional, whole-class book approach throughout my entire ELA schooling. Because I like to read, I never groaned about page counts (although I HATE HATE HATE HATE HATE Huck Finn and by the time we read it as juniors, it was my 3rd read of the book), but I hated picking apart every book to death. Symbolism, theme, mood, ugh. I wanted to talk about plot, character development, sentence structure, even! I wanted to talk about its events made me feel, what I would do in the same situation, etc. I wanted to just be able to read the book for the sake of the book. I also always felt like the teachers were expecting the “right” answer, but I feel reading is such a personal experience and it’s awfully presumptuous for us to “know” what the author’s intention was. If the writer is good enough, theme and mood and all that jazz ends up in there without it necessarily being intentional. If you set out to write a book where your goal is to use a scarlet letter A to represent more than just adultery, then it’s going to be a pretty dull book and poorly written. I don’t actually look back and think that any of my English teachers were “bad” teachers, but I didn’t dare major in English in college because I didn’t want beat a dead horse with every book. Luckily though, I did enough of my own enjoyable reading outside of the classroom, that my in-class experience couldn’t squash my love of reading. I would have loved to have been in Miller’s 6th grade class! Julie, what you describe is what most ELA teachers are guilty of doing at some point in our lives; the first year I taught To Kill A Mockingbird, I not only killed it, I cracked open the body, pulled out its intestines, and tried to identify what the worms it ate had eaten. It was horrible, particularly because I killed any chance they had of enjoying my favorite novel. I don’t think that I’ve ever been a “this is the only interpretation so repeat what I tell you” kind of teacher (Chris, you can tell me if I’m wrong on that). I’m a huge proponent of class discussion, and try to balance giving students an opportunity to make connections between the work and life with appreciating how the writer creates a work. In some ways, it’s like the inquiry method. What is the author trying to say? How does he say it? Why? As in science, you make hypotheses, then you examine the evidence and see if your hypotheses hold up. That said, while I tend to stick to the text itself for answers, there are situations when authors have openly discussed their intentions and their choices, and I will sometimes bring those points into a discussion to see how/if that affects students’ perceptions. We talk about the fact that readers make their own meanings that don’t sync with what the author originally intends, but that those meanings still have validity. Janet, you definitely weren’t a “this is the only interpretation so repeat what I tell you” kind of teacher”. If anything, you were the opposite! I agree with your thoughts about teaching ELA being inquiry-based, and sticking to the text for the answers. Just yesterday, I had to pull my students’ throttle back at bit on the inferring while we were close-reading a paragraph from “Angela’s Ashes”. It’s okay to infer, but it’s sometimes even better to just stay on the surface. Investigating the form and function of a text can be just as rewarding, and can reveal an author’s intent in a more clear way. I’m here because my colleagues and I have noticed a significant drop-off in the number of students who read (for pleasure or for class), and this book sounded as though it would help us address that. Also, I enjoy talking to people about the art of teaching. Right now, my main area for improvement is integrating technology into class; more specifically, working to have the students using technology to transform their learning. Earlier this week, when I asked my students if their teachers were using Google Classroom, about half the hands in the room went up, and one student said, “They’re using it, but they’re using it badly.” There was definitely a time when that comment would have caused me not to try Classroom until I’d mastered the ins and outs and could come across as an expert. Instead, I pointed at the young man and said that I needed him to teach me how to do it right. There are still wilderness moments, but I’m learning how to read the tree markings to get back more quickly. Reading “Chicken Soup with Rice.” I loved the rhymes and the Maurice Sendak drawings, and I’d break into song, changing up with rhythms and the voices. As I got older, I’d find authors that I enjoyed and devoured everything I could find written by them – Encyclopedia Brown, The Great Brain, Judy Blume, Paula Danziger . . . James Patterson, Patricia Cornwell, John Irving. I also loved talking to people about books and sharing some “aha” moments when we’d notice small details that connected. The largest way it shapes who I am in a classroom is that my enthusiasm for literature often infects students. I also remember “book-shaming” – having people express dismay by hearing that I liked certain books or authors (generally the popular authors who aren’t the best writers) or telling me that I must be missing something if I didn’t like a book that they loved. I try to give my students opportunities to talk about whether they like certain books, reminding them that I’m not the author, so I don’t take it personally when they don’t. I am Danielle Wells, I am a friend of Ms. Beth Hughes from college and have always admired her gift of teaching. I recently became certified as a library media specialist. I am working as a grade 1-5 school librarian in NH. I teach each grade for 50 minutes each day and I see the students once a week. I have always loved reading and some of my fondest memories are when my mother would read aloud to me. My favorites were Charlotte’s Web, Little House on the Prairie, Stuart Little, Where the Red Fern Grows… you know, the good old stories. Now, it is my job to help students to find books that will make them love reading. I have joined this book discussion to find ways to reach the students that need that extra encouragement to love reading. I hope to draw from the experiences of other educators and learn from your success stories. I also hope to find ways to connect with the teachers in my school to build their classroom libraries and foster the love of reading in their own classes. What brought you to this online book discussion? What are you hoping to gain from it? I joined at invitation from a smart, savvy literature teacher. I am looking forward to capturing insights on teaching. In the first chapter, Donalyn Miller discusses what she used to do and how she was “lost in the wilderness” (12). Can you think of an aspect of your craft as an educator that you could improve on? Have you ever been “lost in the wilderness”? As a participant in the world of adult learners I am often lost in the wilderness of routine compounded by organization change. This may seem like an oxymoran, but it is so true. Each day is processed through routine; each day is challenged by changes in people and the roles they play. These components cause adult learners, and possibly children, to focus on the immediate and to be closed to learning. Trying harvesting manna in that wilderness! What were some of your first memories as a reader, and how does this shape who you are/were in the classroom? As a child I had free access to the bookshelves in the classroom and the library. My aunt used to send me books as well. At home we have a collection of classic novels which I read my way through many times. I must have read Black Beauty five or six times. All of this despite being the ‘lowest’ reading group in the first grade and the poorest speller with the honor of having my name on the bottom of the list on the bulletin board. We also did not have a television at home until all my brothers and my sister and I became fluent readers so books were where stories took shape. I love talking to Beth and Chris about what they’ve been doing to reignite a love of reading in their students. I decided this week to try the ten minutes of reading at the start of class and to use Goodreads in my own classes. Ever since they’ve embarked on this journey, I’ve wanted to give it a shot, but always talk myself out of it worried that I won’t have time to meet the other curriculum requirements. I joined to learn more from other people and to join a community of people interested in promoting reading for life. I want to find ways to connect what students like to read to my lessons more. I vaguely remember, but am frequently reminded by my aunts and uncles, that I would accost them at the door with my book bag and make them read to me to gain entry into our house. I bulldozed through books as a girl…and then high school happened. I got too busy. I only read for pleasure during the summer. I now make a point of reading daily. I read more now than I did as a student, but I don’t think I would have missed it if I never had the taste of it. I have a hard time understanding why my students don’t love reading as much as I do and why they roll their eyes when I share my latest read. Ch. 2 Question 1: I always want my students to know I’m a real person with likes and dislikes and opinions, and not just an authority figure who only talks about chemistry. I’ll tell them about my weekend, or the crazy dream I had, or the silly thing my kids did. I ask my students about themselves. I just try to be genuine. And of course, since I’m a big reader, I’m constantly talking about what I’m reading. I always had kids the finished tests early and would pull out a book. I’d ask them about it as I was circling the room, or let them know it was a favorite of mine. I think my students appreciated seeing me as something more than a science teacher. Ch. 2 Question 2: I love choice. I love choice in reading. My sister teaches English in FL and she has a classroom library she has accumulated from several years of shopping at thrift stores and secondhand book shops. I also try to implement choice in my chem classes by giving students options for projects. This includes both content and format. I’m currently covering a paternity leave position at St. Mark’s School in Southborough, MA and instead of a mid-year exam, I’m doing a project where students had to read a chemistry article (provided by ChemMatters magazine – a publication by the American Chemical Society specifically for high school students) and perform an extension piece related to the article. I have everything from kids researching different materials used in artificial skin for movies to eating hot salsa and trying foods to relieve the burn. It is so much fun! I’m loving it and so are the students. Perhaps in the future, I can incorporate SSR with the chemistry articles from ChemMatters that usually are special add-ons in my classroom and not a regular teaching tool. Ch. 2 Question 3: I was an underground reader in school and am an avid, lifelong reader today. I was the kid that got in trouble for hiding books in my elementary school desk and reading instead of listening to the teacher. I was also the kid that read every book on the summer reading list even though only one or two were required. As for teaching, I think dormant students are the most frustrating. Developing can be worked on with assistance, and underground can become above ground with enthusiasm, but dormant students confuse me. If you can do it, and don’t seem to mind doing it too terribly, then why drag your heels about it? I find this with any inconsistent student, regardless of subject. Perhaps I’m too Type A, but I just can’t understand why you wouldn’t put forth 100% effort all the time!